Back at its Samsung Unpacked 2019 event, the company announced a number of wearables. 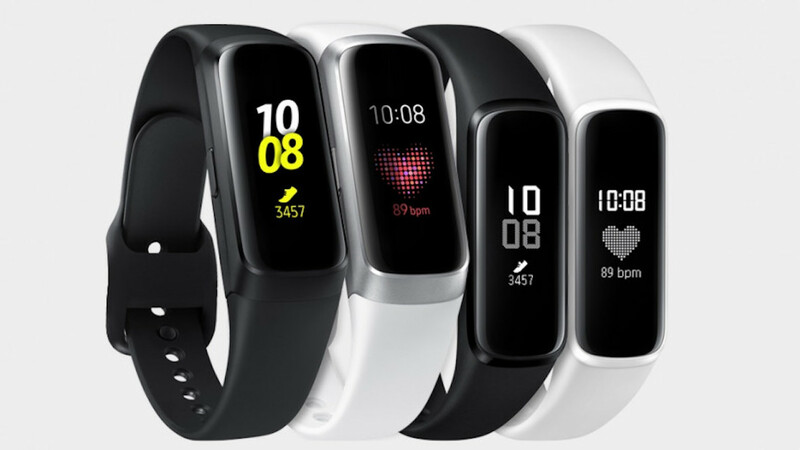 The one that stole all the attention was the new Galaxy Watch Active, but there was also the Fit and, with nary a mention, the Fit e.
Yes, Samsung has two new fitness trackers on the horizon. But what's new about them, and how do they compare to each other? Here's our breakdown of everything you need to know. Take a look at that image above. That's the Galaxy Fit family. The two trackers on the left are the Fit. You can see they're slick and sturdy. On the right, there are two trackers that look a bit more basic - that's the Fit e.
The Fit's got a 0.95-inch AMOLED display with 282ppi. The Fit e, on the other hand, has got a 0.74-inch PMOLED display with a 193ppi count, almost half of the bigger tracker. You'll also notice that the Fit has a color display while the Fit e does not. The Fit stands taller, but it's also just bigger and more heavier. It weighs in at 24g while the Fit e comes in at 15g. We haven't confirmed all the colors yet, but we have seen white, black for the Fit. We've seen the same two colors for the Fit e, but with an added yellow. You'll be using these two in different ways as well. The Fit has a button on the left side while the Fit e has no buttons at all. It's possible that you'll just tap the device to navigate, kind of like an older Fitbit fitness tracker. Under the hood, the Fit has got a more powerful MCU Cortex M33F 96Mhz chip while the Fit e has a MCU Cortex M0 96Hz chip, which is a lesser chip. They both have a heart rate sensor and accelerometer, while only the Fit has a gyroscope. As for battery life, the Fit sports a 120mAh battery while the Fit e uses a 70mAh battery. There's much less to power in the Fit e, so it's likely these two will both sport a week of life. The good news is that the activity and sports tracking on both is pretty much on pair thanks to Samsung's Realtime OS. You're getting your cycling and running and such. Plus, Samsung's automatic workout detection is here. You won't get as much as you will on the Active. There are 90 activities to choose form and you'll have to pre-select them. Both will also have stress and sleep tracking, which is great, but both lack GPS support. While both have heart rate sensors, the Fit e won't track your heart rate like the Fit will. It'll be used for workouts and such, but no 24/7 heart rate tracking. That's likely to save on battery life. Both devices are also 5ATM water resistant, so get ready for some swimming. We know that the Galaxy Fit will be available in Q2 of this year, costing $99. But, while the price and release date of the Fit e are yet to be officially revealed, there are rumors that it costs as little as $35. "gotta" means "must", short for "got to". You just want "got a" in "The fit's got a..."